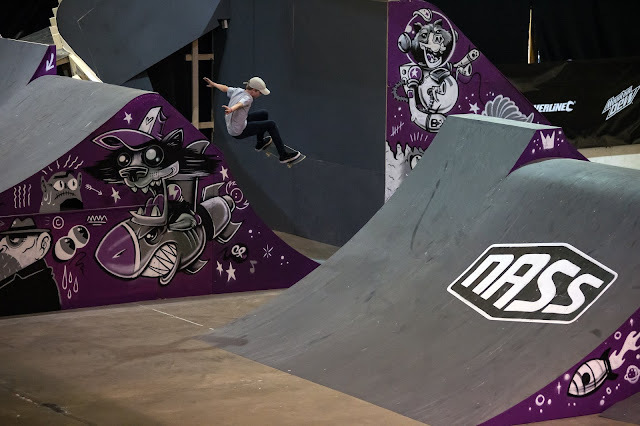 We checked in with Alfie Mills, to see how he got on at this year's NASS and to find out how the experience was for him. Hi Alfie how are you? I’m good thanks. Looking forward to the summer holidays so I can skate more!! So NASS festival has been and gone for 2017, how was your experience this year compared to previous years? It gets better every year, as I get to know more skaters from different places. How did you find this year’s course to skate? Has the course been better in previous years or was this the best layout you’ve ridden on? I thought this year's course was awesome. Probably a bit better than last year's, as it seemed more diverse. You competed in the AM park finals and got a fantastic result of 22 out of 60 entrants. How do you feel about the result, and what would you do different next year to move further up the table? I was really happy with the result as I did a little better than last year, plus it’s just cool to ride the pro park with skaters of all ages. Next year I’ll just ride like I’m at a Park and try not to think of the time limit! As always it’s been a pleasure to catch up with you. Is there anyone you would like to give a shout out to before we sign off? I’d like to thank the Kings Park crew for they’re ongoing support and encouragement, also a big thanks to Jamie Smith and all at Enuff for being a great sponsor and for the regular supply of boards! !